Today I was asked to clarify some details about the Friendly Cardigan free pattern I uploaded to Ravelry some time ago. Looking back at it, I'm embarrassed to note that I would be hard pressed to make sense of it myself, if it were not that it exists as a process in my head. This prototype was made using interlock fabric, just the collar piece being knitted in a simple 1x1 tuck stitch. 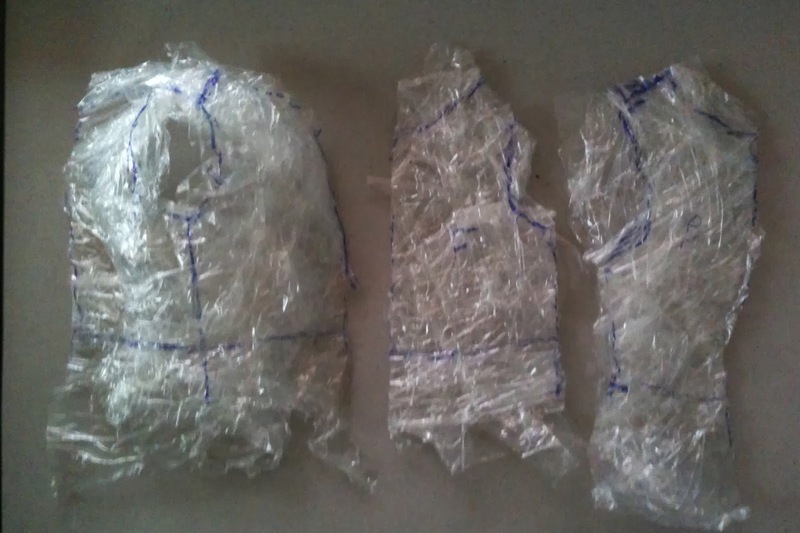 The neck band is attached to the back neck, and the top sections of the front pieces. I'm not sure this illustration adds much, but it really is a magically useful process. edited to get back to the detail of how to work out the slant on the fronts of the cardigan. The black lines represent a standard, one piece front. The sketch shows shaping at the sides. Yours may or may not have shaping. The red lines illustrate the adaption for one side of the cardigan. 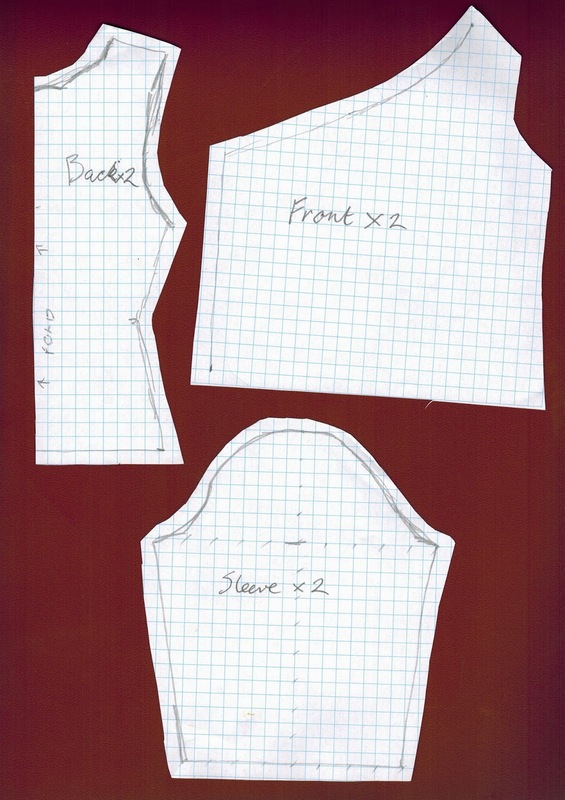 (The other is a mirror image) The upper edge is defined by extending the neck edge across to the lower edge of the opposite armhole. The free side need not be shaped, even if the seamed side is shaped. On the cardigan used to illustrate the pattern download, the neck piece is knitted in Passap Long stitch, and doubled over to cover the cut edges of the main pieces. It is a design feature of this version to have the neck piece longer than the edge to be covered, giving a pleasant asymmetrical vertical to the garment when worn. My most recent outing of this design was this T Shirt, altered to add in a knitted half front in stocking stitch, and a neck piece in 1x1 tuck stitch. 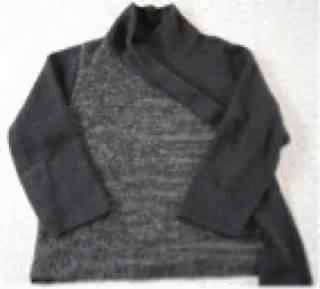 This time the neck piece is sized to match the length of the neck and top edges of the cardigan. I started this posting on a Mac, and am finishing on an iPad. The format has slipped from my control somewhat. I may be able to sort that out some time, but I will publish as is, in the interests of immediate optimistic explanation.. I am keen on the idea of mixing a pre-made fabric with some machine knitted pieces - I always admire this kind of thing in a finished garment yet never really think to do it. Thanks for sharing - a good inspiration! 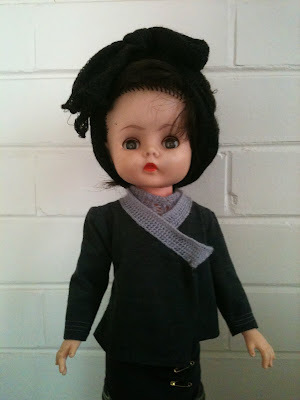 Yes, I think I might sew one in wool jersey, with a knitted collar. I'll have to find the right fabric first. Thanks for the encouragement. Christina, I love your ideas for your cardigan and would love to knit it on my Brothers Bulky, but I need more details on figuring out the fronts. How much wider are they then a regular cardigan? Is the bottom measurement 1/3 or 1/4 larger? Where does the center line fall on your schematic? This would be great for everyone. Thanks! My goodness this is a late reply. The fronts are more or less double the width of ordinary cardigan fronts. The original prototypes were made by cutting one side of a non-cardigan type sweater, then sewing in another piece to make a double layer front.